Blooming Where Planted: Happy Valentimes Day! 14 pictures of Cuteness to describe our fun and festive day. 1. I got the boys dressed in their red waffle shirts, all matchy matchy, and put them on the couch for a photo shoot. God Bless Daddy! He jumped around and was so silly, that between the two of us we got an actual picture of all three boys Smiling AND Looking the camera. Historic! 2. Jacob plays Roll the Ball with Kaylee! 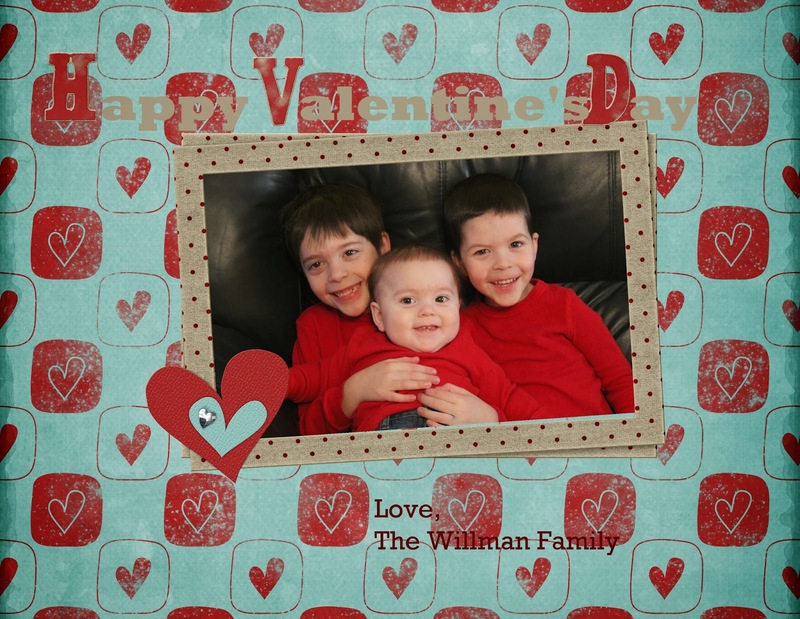 Valentine's was on a Friday this year, so we dressed all our sweetboys up in their red and send them off to school. Well, not Jake. Jake doesn't got to school yet, but we are in Kindermusik class for him. This week, Jake's cousin Kaylee was able to join us. She wasn't feeling quite up for school after having a little work done this week, but she was up for the difficult task of playing with a sweetboy! They were playing catch with each other, I was surprised at how well Jacob rolls the ball! When we got out of the library, it was Snowing. They'd told us that a dusting was coming late in the afternoon. But...surprise! It was not late in the afternoon...and it didn't end up being a dusting. Since I had many things planned, I ended up driving all over Brownsburg in the snow, which was actually pretty lovely. I probably would have been in a worse mood if it hadn't been so pretty. 3. The Robins hang out in the trees. I had to drop off Eric's Valentine's present (a new box spring) at home before picking up Sam from school, and I found these robins taking over these trees. They were all fluffed up, and pretty, though from my car that doesn't come out as well. 4. Snow covered park. After picking up Sam, we drove thru McD's for lunch, and I took the littles to Grandma's for a bit so I could help out at Chris's school. Glad I got a head start, because it was slow going. Beautiful...but slow going. Here were some trees (and the street, though it's hard to see that, because of all the white on the ground) by her place. It used to be a trailer park on 200N, but all the trailers are gone, so now it's just a park. 5. Chocolate Covered Sweetness. For Christopher's Valentine's Party, the room mom brought in a fondue pot, and we dipped strawberries in chocolate (and pretzels, marshmallows, and rice krispie treat bites). It was Awesome! 6. Snow covered...Again!?! We're near breaking the record for snowiest winter, we were supposed to get a dusting, but it was 5 inches easy. I had to do my windshield after kindermusik, after picking up Sam, after dropping off the boys. And by the time we left school, I had to do it again! Chris thought all this snow was Great! Although, he probably wouldn't have enjoyed as much if he'd had to be among the kids that had to stay 20-30 minutes late after school because the buses were running late. He was Lucky, his ride was already there! 7. The trees on 300N. Traffic was moving So Slowly. Better slow and safe than rushed and wreaked, I say. However, it was stressful. But I'd look out the windows, and the snow covered trees were so pretty. 8. Something about the heavy moist snow made it so gorgeous on pine trees. But it seemed all the pine trees I got stuck by were right in front of telephone lines, not making for a nice photo. This one, out front of St. Malachy was the first that was not. 9. The drive from school to Grandma's and back home again took so long that 2 out of 3 sweetboys were asleep. Chris was so warm with his mask on that I thought he was going to doze off too, but as soon as I broke out the camera and put it up by the rear view mirror, Chris perked up. 10. A view over the creek. On 267, since we were moseying along at 2 miles per hour, I could roll down the window and snap some pictures of the pretty things we passed, like this creek by the cemetary. 11. The cemetery. I know some people don't really think of cemetaries as beautiful, but our town has one right smack dab in the middle, and this time of year, with the snow falling down, it is beautiful, and peaceful. 12. The graves and the trees. Our little cemetery is surrounded by woods, and it was so pretty all snow covered. Going so slow gave me a lot of opportunity to observe. While we were inching along, we started talking about dinner. We decided since it was taking 3 times longer to cross town and it was already 5 oclock, and all traffic was stopped, we'd swing by Steak-n-shake for our supper on the way home. 13. When we got home from all the stressful driving, this was the happy site that greeted me. The easiest driving in the whole town was my own Driveway! Thanks to my sweet hubs for shoveling the driveway to get us all in. I brought him rewards for his efforts too, steaks - n - shakes. :) I love the chocolate covered strawberry milkshakes, and Sam's batty for the green ones. We each got our favorite kinds. So yummy! 14. The last pretty present. After we piled in, we sat down and watched Olympics coverage on tv while eating our yummy dinner. It was kind of quiet and nice, a big change for the frazzled feelings I'd had driving around all afternoon. I sat down to eat, and Eric brought me in the very last orange shandy, opened it, and put it in my hand. I had forgotten how 2 hours prior I had said I needed a drink. It was still true, and I loved that he hadn't forgotten. It wasn't until late, that I made it into the kitchen to see that Eric had sent a bouquet of flowers too! (Sorry the lighting is wonky) I got a sweet bouquet, and a tiny mini-rose, and Star Trek Into Darkness, and a renewal of my AAA membership. And chocolate. That was all I needed.